Long before Ali Gorman was delivering medical reports on Action News, she was starring as Gretel in The Sound of Music in what was then the Glassboro Summer Theater. The Eastern Regional grad has fond memories of her South Jersey childhood, which include “spending probably too much time at the Echelon Mall.” Gorman left Jersey for Georgetown University, where she graduated with a nursing degree before serving four years as a Nurse Corps officer in the Navy. It was then Gorman decided to obtain her master’s degree in journalism and, after stints in Jacksonville, Fla. and Lansing, Mich., she joined Channel 6 in the spring of 2008. We spent some time chatting with Gorman about being back home and her passion for health-related issues, and found out that was indeed her who appeared on season two of The Mole, the short-lived reality game show hosted by Anderson Cooper. SOUTH JERSEY MAGAZINE: Being that you’re from the area, how excited were you when you got the job working at Action News in 2008? SJM: You worked for several years as a nurse. What inspired you to get into that profession? AG: I have always been interested in science and health and biology. And I just wanted to help people. I still have my R.N. license and work one day a week as a nurse. SJM: And years later, what made you decide to switch gears and get into journalism? AG: I liked the health reports on the news and I wanted to do some of my own reports. I love being able to tell peoples’ stories while also giving people information. SJM: What was one of the more memorable experiences you had as a nurse; serious, funny or otherwise? AG: When I was working at the recruit medical center one night [while I was in the Navy], there was a food poisoning outbreak at the cafeteria and recruits were pouring into the clinic. I won’t go into details, but it was like the scene in Stand by Me. SJM: You mentioned that you’re still somewhat involved in nursing, what do you miss most about your former career? AG: Even though I get to work one day a week as a nurse, it is not in a hospital. And sometimes I miss the hustle and bustle of a surgical floor … or getting to see a patient go home healthy after weeks in the hospital. I also miss being able to go to work with my hair in a ponytail and no make-up! SJM: In your role, you get to not only inform people but also help them with health tips and advice. Do you find that to be the most rewarding part of the job? AG: Yes. The biggest compliment I get is when someone tells me they made a change for the better or got a necessary medical test because of one of my reports. SJM: So you were on The Mole. What was your experience like? Do you watch much reality TV these days? AG: When I did the show, reality TV was just getting started and it wasn’t very popular. So to be honest, I didn’t know exactly what I was getting myself into, but it was a fun experience. As for now, I watch The Bachelor. Every season I say I am not going to watch, but every season I watch! 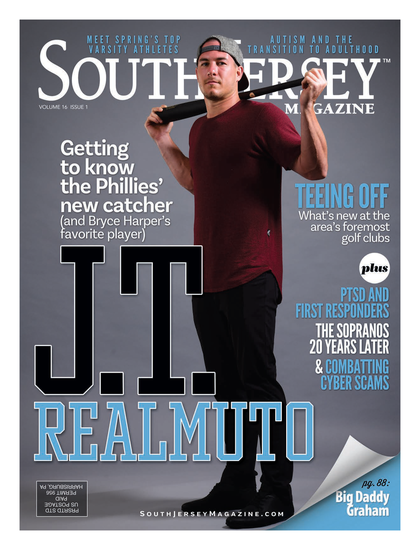 SJM: This month’s magazine is a big food issue, where are some of your favorite South Jersey spots to get a bite to eat and why? AG: I spend a lot of time in Haddonfield and I love the little bistros and cafés there. I like being able to walk around downtown. I also like the restaurants in Collingswood. SJM: What other ways do you like to unwind when you’re not on the clock? AG: I do a lot of different fitness classes—boxing, core fitness and old-school step. I also like to spend time with my nieces and nephews. I get to watch a few of them play baseball and soccer in Berlin so that is always fun. And I read a lot and love movies.